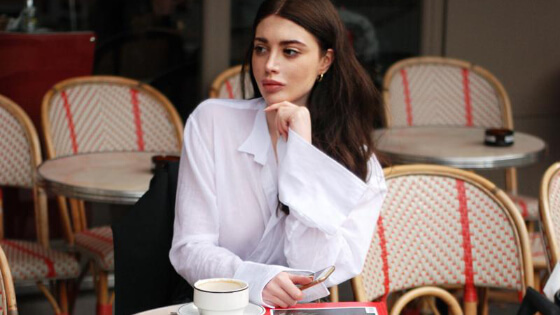 While you have an excellent style, it’s not all that you need to get caught by street style photographers or create a capturing fashion blog or even an Instagram profile. The secret of success is charming photos, yet creating a great photo sounds easier than it is. There are two major parts in the equation. Photo shooting technique is one thing, involving composition, proper location, background, right lenses, etc. The good posing is the other and is equally more important. There are plenty of different ways to stand for the photographer. We have selected 20 different ways to look great in the pictures. Scroll down to find your personal favorites. We guess that everyone who is into fashion has noticed that the most successful street style poses is… walking. It perfectly showcases your outfit and expresses the way clothes look in real life. Sometimes there is a little problem with acting naturally while you are being shot. Well, the phone is the way out since we do it every spare minute. Street style is all about “Fashion stole my smile” but look how beautiful smile suits with a colorful outfit. The way out of the problem “where to put my hands” — an umbrella. It’s an extra accessory that helps you with posing. This pose’s trick is slightly lifting your chin to catch the sunlight. Also, it looks beautiful when eyes are closed. You can sit wherever you want no matter if it’s stairs, fountain or floor. This way your outfit will be shown from another perspective. The car in the background makes your photo look amazing. Choose the fanciest car on the road and take a picture with it. Will be better with retro one. That coffee-to-go cup makes the unique atmosphere in your photo. You can drink, carry or just walk with it. This action averts your eyes from the camera, and it’s especially helpful if you are a little bit shy of the lenses. Cover your face with hand, hair, or something else. This pose completely focuses everyone’s attention on your outfit. One important moment: make sure sunlight is directed towards your hair! Try to shake your head from side to side to make your hair flying. This way of posing is really popular with denim. Street style stars put their hands in jeans, skirts or shorts pockets. This is not an easy pose as it’s hard to control your face during the leap. But it looks compelling in any case. The posture that gives your photo a true Parisian-chic vibe. Take a seat at the nearest pedestrian cafe, cross your legs and order a drink. This pose is something between studio photo shooting and street style. Your mission is to imagine all professional staff backstage and act like a model – this gives power to your photo. Your bag is your best friend. It has once again helped you and this time with posing. Hold your darling with both hands to focus attention on it. There aren’t any rules that say you have to look and stand forward to the camera. The over-the-shoulder glance is popular pose during fashion weeks and generally among bloggers. It doesn’t matter if it’s windy or not when the photo is taken. The pose with you tucking your hair behind the ear is highly romantic and alluring. This one is somewhat similar to the previous, and this pose is traditional for any photo shoot. It looks beautiful with a smile which gives warmth to otherwise harsh-feeling look. We promise you, this one never loses. Choose your favorite outfit and make yourself comfortable in the front of famous structure in your city or while traveling. Pro tip: watch out for suitable colors!